Using GetInstrument without an input would be incorrect. What are you expecting the output for GetInstrument to be? I would like to know what output you expect, not the input. I also still do not understand why you are using GetInstrument without an input and what you expect that to accomplish. Are you trying to get the name of the current instrument? It looks like your string input is likely not formatted properly. Can you show some code? For example, the following would share the current instrument name and the current close price to twitter. Using the Strategy Builder is going to be another matter entirely as it will automatically concatenate the separate strings for you. 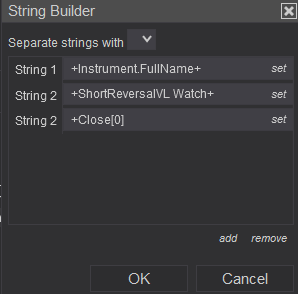 When you want to create a string that contains the instrument name or the close price(or any other object) you need to click where it says "set", and then navigate the folders to find the object you want to use. You will not be able to simply enter in the information I have given you as a string. Additionally, please be sure to include the fact you are working in the Strategy Builder to avoid confusion going forward.